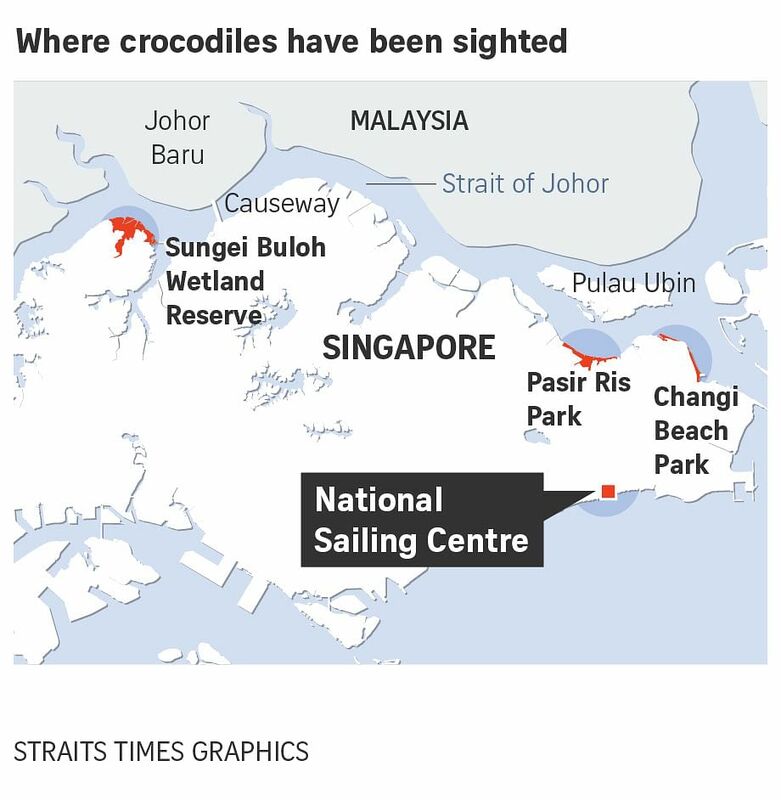 SINGAPORE - The National Sailing Centre (NSC) has suspended all its water activities after sightings of a crocodile at a construction site at East Coast Park on Monday (Nov 6), even as efforts to capture the crocodile are under way. About 120 sailors were affected when water activities were ceased that day. "It was spotted in the water at the site, where a canal is being built. The Singapore Sailing Federation informed the National Parks Board immediately and called off all water training immediately," said the spokesman. "As the safety of the participants are our priority, on-water activities will be ceased until further notice." "It was likely an estuarine crocodile (Crocodylus porosus)," he said. "Estuarine crocodiles are known to swim freely in the waters between Singapore and Malaysia." NParks is working with the Agri-food and Veterinary Authority (AVA) to monitor the sightings, catch and translocate the crocodile. "We have also advised the operators of establishments along the coast to take the necessary precautions," said Mr Chia. Advisory notices have also been put up in East Coast Park near water edges. Worried parents shared the information in their WhatsApp group chats, asking about the safety of their children. A parent who declined to be named told The Straits Times on Monday that the NSC prevented all kids from launching their craft in the water on Monday. "All these kids shouldn't be allowed to sail in the area unless that crocodile is relocated," he said. He added that there is a sailing regatta coming up next weekend involving 200 schoolchildren at the NSC. "Many of the parents are very worried now," he said. "Because this is a National Ranking regatta, they fear they will be forced to put their kids in harm's way." On Tuesday, signs were put up at the beach near the NSC advising beachgoers on what to do when encountering a crocodile. The NSC informed the schools and coaches and put up advisory notices to inform the public as well. The NSC is in talks with NParks, the Agri-food and Veterinary Authority and other relevant agencies. It is also looking for alternatives for its sailors and areas where it can hold its events temporarily. "We will continue to observe the area to ensure it is safe before any water activity is conducted," said the NSC spokesman. NParks advised East Coast Park visitors to keep to designated paths and away from water edges. Those who encounter a crocodile should stay calm and back away slowly. They should not approach, provoke, or feed the animal. Those who need help should call the NParks helpline on 1800-471-7300. In August this year, there were at least two sightings of crocodiles at Pasir Ris Park. Mr Kalai Vanan, Acres' deputy chief executive officer, told ST that the animal group is unsure where the crocodile came from. "The crocodile could be native to us from our coastlines or from neighbouring Malaysia," he said. "At this point we think that the crocodile could possibly be the same animal from Pasir Ris and Changi which is slowly travelling around our coastline, contributing to the recent frequency of sightings, but this has yet to be confirmed." He added that crocodiles "are shy animals which generally stay away from people".